In the two years since we've been offering physical albums to our design clients, Align Legacy Books have found their way into hundreds of homes. These books are truly heirlooms, and we're so proud of them! That's why we're always grateful for the feedback about Align Legacy Books that we receive from our clients. One of the comments that we have heard is that you want more variety in cover text -- both fonts and finishes. We're so excited to show you the result! Above left: Cardo font on Parchment linen. 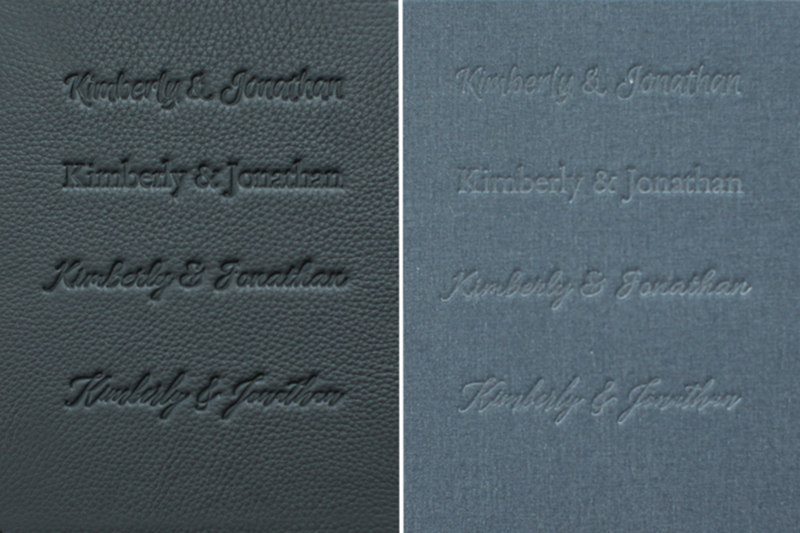 Above right: Adelicia font on Eight Ball leather. We have always offered a sans serif font that we find elegant and readable. We're not taking that away, but we ARE offering several additional fonts, so that you can choose the one that best suits your clients' style! Along with a dignified serif font, we've also added 3 script fonts that all have their own unique flair! 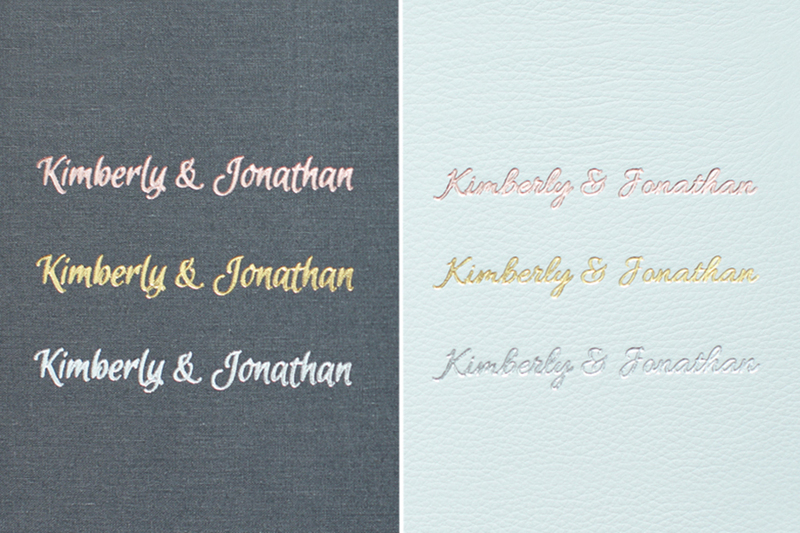 Above left: Euphoria font on Silhouette linen. Above right: Allura font on Yukon leather. Along with the traditional blind (clear) debossing, we've added three new metallic finishes. Choose from Rose Gold, Gold, Silver. These colors are elegant and on-trend, and your clients will love them! And if you prefer not to add a color to the text, choose Clear for the classic blind debossing look! 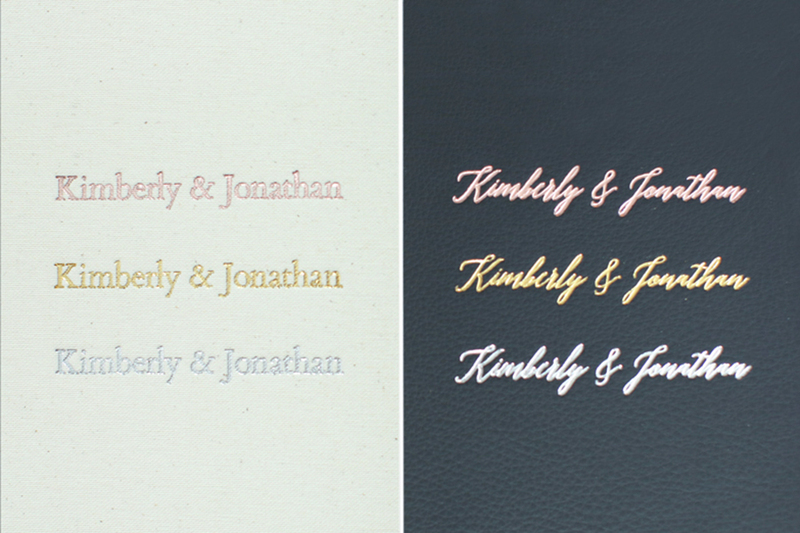 Above left: Euphoria, Cardo, Allura & Adelicia fonts on Eight Ball leather. Above right: Euphoria, Cardo, Allura & Adelicia fonts on Silhouette linen. 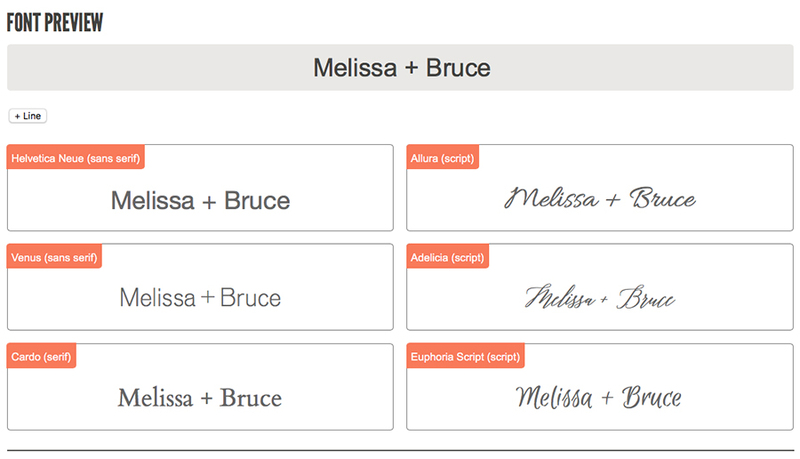 With more fonts to choose from, we wanted to make your decision as easy as possible! So we have created a Font Previewer to let you try them out. When you type your text into the box at the top of the page, you'll see a preview of what it will look like in all of the possible fonts. Click here to try out the Font Previewer, or click the link that says "Explore text options" when you're placing your Align Legacy Book print order. 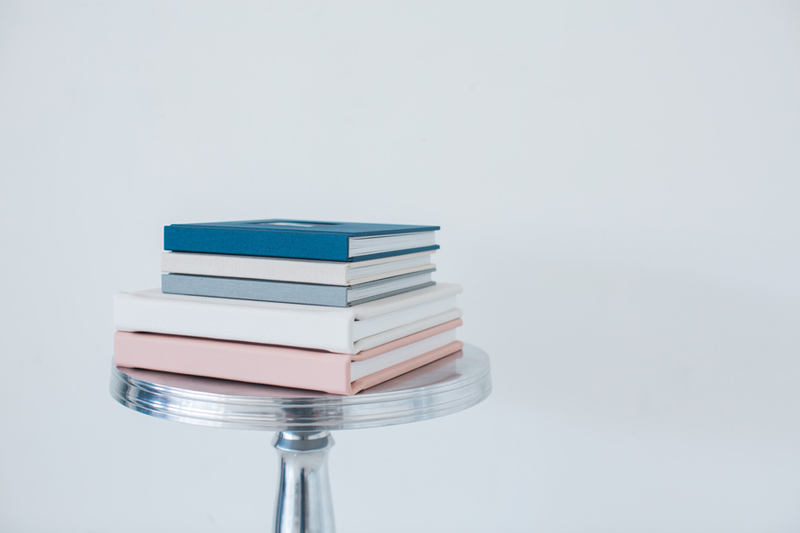 We're so excited about these new text options for the covers of your Align Legacy Books! We hope you are, too! For more information about Align Legacy Books, click here. 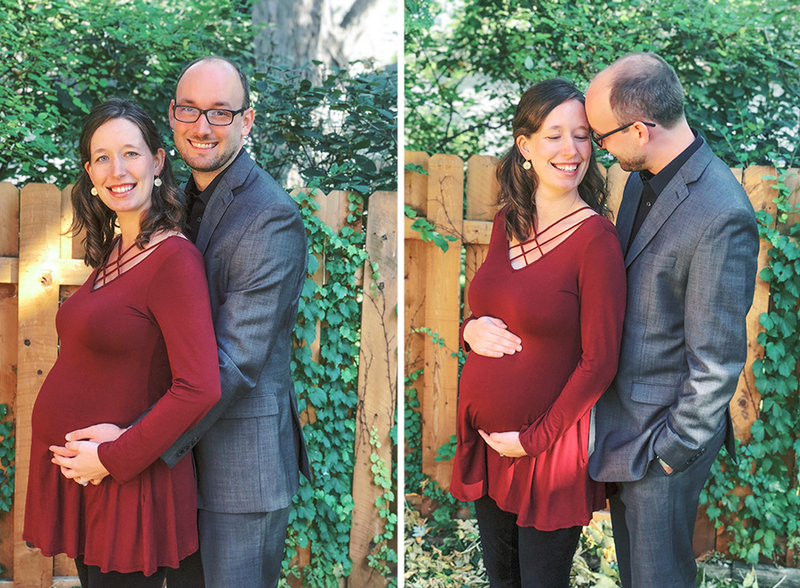 A new Align baby + a new general manager! First up, I'm currently 34 weeks pregnant with a baby girl due next month! I'm at the stage of pregnancy where I make an "oof-da" noise every time I stand up (that's my Minnesotan accent coming out), anything that falls on the ground is dead to me, and I love feeling all the baby kicks (although I wish I could reschedule her 4am dance parties). It blows my mind that this little babe is guaranteed to be one of my life's VIPs even though I haven't met her yet. I'm beyond excited for her to make her appearance around Christmastime! Then as I take on my new parenting role, I'll also be changing my role within Align by leaving the General Manager position. Don't worry, I'm not disappearing from Align completely! I'll be staying on as a designer after the baby is born (besides a few weeks of unplugged maternity leave), so feel free to request me to be your designer anytime you're missing me! :) You're also welcome to follow me on Instagram @deniserathbrinkman or email me at denise@alignalbumdesign.com. I'd love to keep in touch! I've absolutely loved running Align's day-to-day project management and customer service over my past 5 years as General Manager. I've especially enjoyed being able to help the businesses (and sanity!) of so many photographers, many of whom I now consider to be friends. However this new life stage feels like a natural transition point in which to leave this role and pass on the torch. 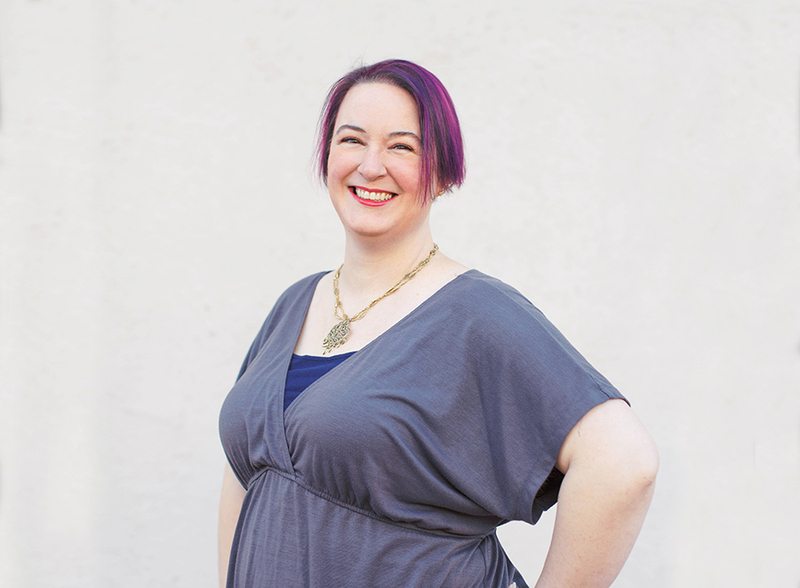 I'm thrilled to introduce you to Align's NEW General Manager, Alaine Sepulveda! Some of you may recognize her as the rockstar office manager of Melissa Jill Photography, so she's already fully immersed in the world of wedding photography and album sales. She's also resourceful, detail-oriented, and an excellent communicator - so I feel very confident that Align will be in great hands. We'll be sharing the job (and the info@alignalbumdesign.com inbox) for the next month and then she'll be taking it from there! Hi everyone, Alaine here! Thank you so much for welcoming me to the team, Denise! My background is in writing and communication, so photography was a whole new world to me before I started with Melissa Jill Photography in 2014! Since then, I've loved learning about the industry and meeting the talented people in it. Working for Align's founder Melissa in her photography business has been all about multi-tasking, which I know will serve me well as I step into this new position with Align! Luckily, Denise is the BEST at documenting tasks, responsibilities and helpful suggestions, and Melissa is always ready to provide support and advice! Align is part of such a great photography community -- it's so inspiring to see professionals lifting one another up and sharing their knowledge! Behind the scenes, I've been helping to run Align's Instagram account for a while now, and I'm looking forward to connecting more directly with our clients, and with the larger community. Denise is leaving big shoes to fill, but I'm excited to step into them! Click here to visit our About Page to meet the rest of our amazing team. Your clients know that albums make amazing Christmas gifts, but do they know how long the album creation process takes? We want to help YOU help THEM have their albums in hand by the holidays, so we wanted to share a refresher on our design turnaround times and announce our holiday print deadlines. Due to the back-and-forth nature of the design and revision process, there is no one-size-fits-all estimate for how long the design process will take from start to finish. Please allow yourself and your client ample design time (multiple weeks) by placing your design order AS SOON as possible. Please note that our production facility will focused on rush orders throughout December and then be closed for the holidays. So non-rush orders placed in December (even if you don't need them by Christmas) may not be started until January 2nd, making the estimated ship date January 23rd (at the very latest). -Or pre-purchase Align Credit (in any amount) on your Account Balance page which will be automatically applied to your balance. PHEW! That is A LOT of detail! We're SO excited to help you serve your clients well this holiday season! It's Our Birthday But the Gift is for you! Guess what! Align Album Design just turned 6 years old! HAPPY BIRTHDAY TO US!! Oh wait, were we supposed to be humble and rely on our friend to secretly tell the waiter that it's our birthday so that we can act surprised when they bring out the free dessert and sing to us?... Too bad! It's our birthday and we're proudly celebrating!!! We want to send out a huge THANK YOU to all of our amazing clients for your friendship and business over the past six years. Y'all are the best! We wish we could virtually share our free birthday dessert with you (embarrassing sing-along spectacle included), but instead we'll celebrate by giving out $16 in Align Design Credit -- that's two free spreads -- to photographers who place a new album design order this week! To qualify for the deal, use the promo code: [EXPIRED CODE REMOVED] on your album design order form, submit your images, and pay your $75 deposit before the end of the week. If all three steps are completed before Saturday, April 7, 2018 at 11:59pm PT, we will add $16 to your credit bank that will automatically be applied when your next album design balance is due. Limit once per studio. 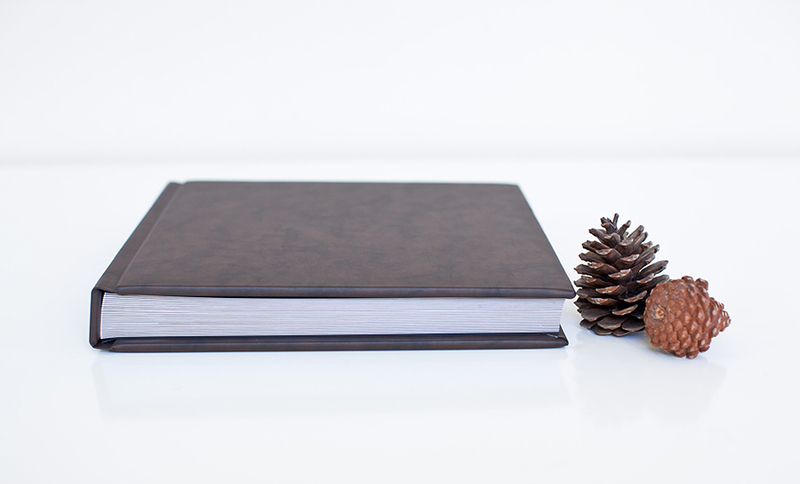 Credit valid for our design service only, cannot be applied towards physical Align Legacy Books or other products. Join the celebration by filling out a new album design order form. Thanks a bunch! Also note that our production facility will focused on rush orders throughout December and then closed for the holidays. So any NON-rush orders placed in December may not be started until January 2nd, making the estimated ship date January 25th (at the very latest). We're SO excited to help you serve your clients well this holiday season!